Guest pose for a picture at the swearing in of Chief Mawarire. MWENEZI - Elliot Jahwanda is the new Chief Mawarire in Mwenezi. 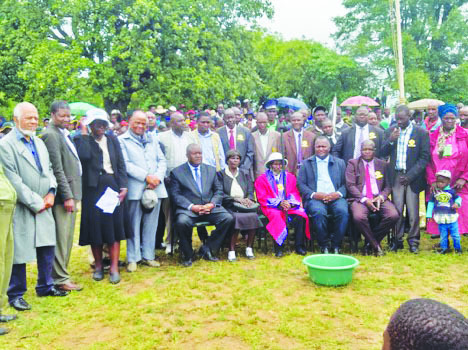 His swearing in ceremony was presided over by the Minister of State for Masvingo, Ezra Chadzamira two weeks ago at a funcution held at Mawarire Primary School. Mwenezi District Administrator (DA), Rosemary Chingwe confirmed the inauguration to The Mirror. She said that there were hundreds of people who turned up for the event including senior Government officials. Chief Mawarire succeeds Mamhanje Vengo from the Tagwira family as the chieftaincy rotates among three families. Chahwanda (77) who was born in 1942 is married to Rebecca Hhlongwani and they have six children. 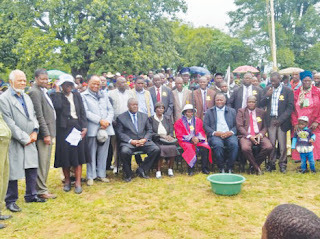 Addressing the inauguration Chadzamira said Manyuchi Dam will be key in the devolved economy of Masvingo as it will be used for poverty alleviation in the district.